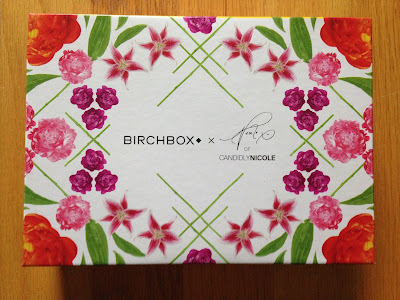 My August Birchbox arrived very early this month, which made up for my very late box last month. 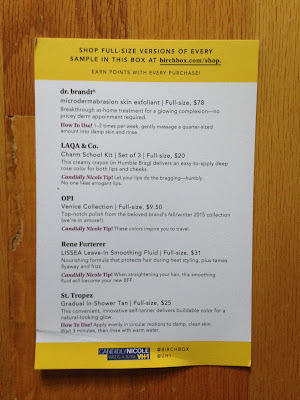 This month I chose the guest curated box, because I loved all the samples that were included. And there was one I really really wanted to try! So, I knew what I was getting, but couldn't wait to try everything that was included. The box designs have all been so pretty lately and this month was no exception. Here is a peek inside my box. Birchbox always includes an information card. 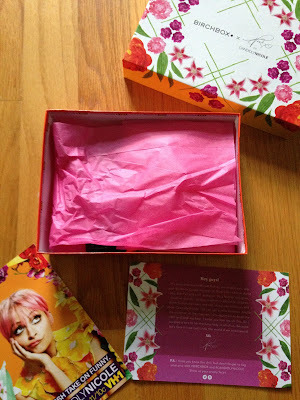 The guest curator this month was Nicole Richie from "Candidly Nicole", so my box had a little note from Nicole on why she chose the samples she did. The sample I was most excited to try was St Tropez Gradual In-Shower Tan. 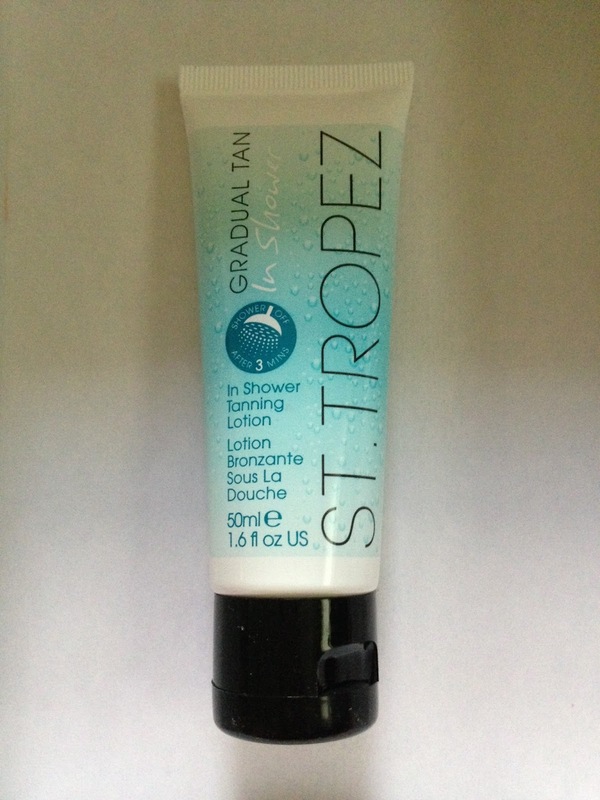 This is a self tanning cream that you apply to wet skin in the shower and then wash off after 3 minutes. I love the application process. I stopped using self tanner because I was tired of staining my clothes. I never waited quite long enough before getting dressed after applying the cream. This is great, because you wash it off. It is also the best smelling self tanner ever! It leaves a faint floral scent that I love. Nothing like the tanning creams I've tried in the past. I have tried this the past 2 days in a row and I may have a very very subtle tan, but nothing drastic. I will continue to use the sample, but I'm not expecting a deep dark tan from it. I still love it though! 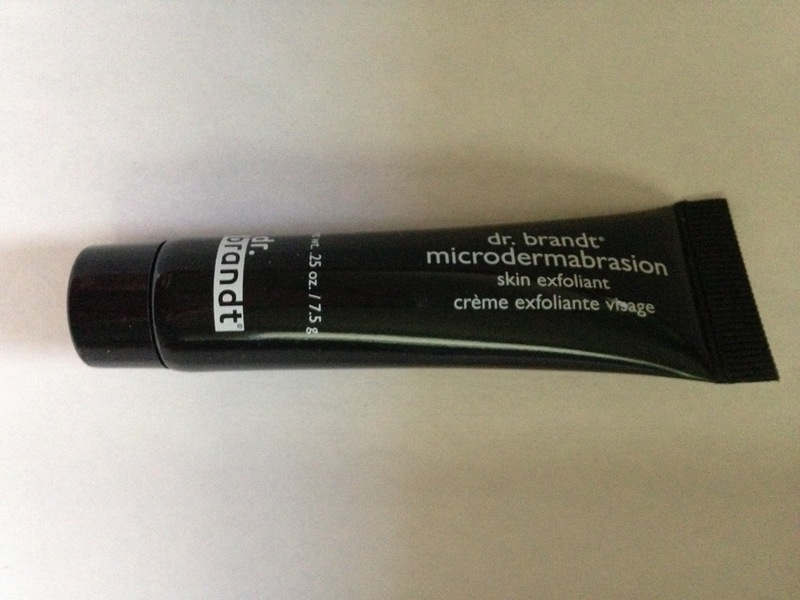 I also received Dr Brandt Microdermabrasion Skin Exfoliant. I was happy to receive this sample, but didn't think too much of it because I've tried lots of exfoliants and thought I already knew my favorite (Vasanti Brighten Up Enzymatic Face Rejuvenator). Then I applied this exfoliant and was pleasantly surprised by the fine granules, then the citrus scent woke up my skin like nothing else and made it feel really really clean. This is perfection! Then I looked at the price (full size $78) and though I probably won't purchase this often, it will be a treat when I do! Another love!! I was nervous about the Laqa & Co sample, because the last sample I received by this brand was a very unwearable bright pink that looked awful on me. 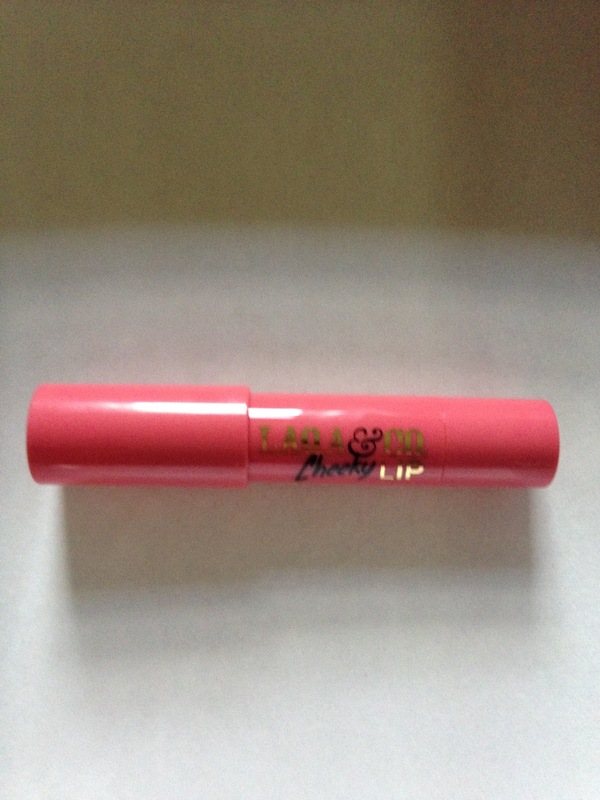 This one is a creamy crayon for lips and cheeks and the color (Humble Brag) was a very wearable pink. The cardigan I was wearing the day I decided to try it was actually the same color, so that might be why I liked it so much! I didn't try it on my cheeks yet, because I'll be honest I have a difficult time rubbing in cream blush and it ends up looking like a blob of color on me. I do love this as a lipstick though, so I will definitely be using it!! 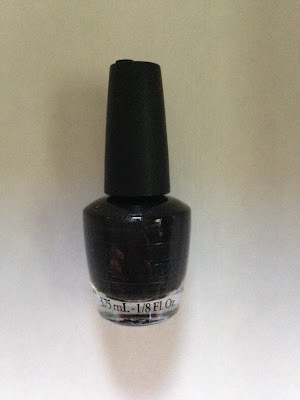 I also received an OPI nail polish sample from the Venice Collection. I looked at the colors online and would have been happy with any of the colors in the collection. I received My Gondola or Yours?, which is black. I am not a black nail polish sort of girl, but I was very excited about it. I don't own black, so I thought this might come in handy for Halloween or for some cute nail art. It does need a few coats for even coverage, but I was happy to receive a color I don't already have in my vast selection of nail polishes. 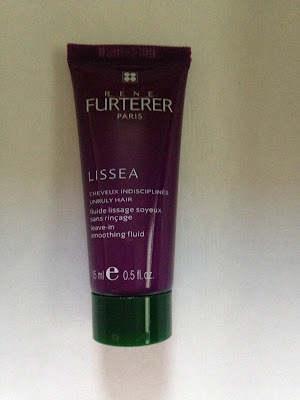 The final sample I received was Rene Furterer Lissea Leave-In Smoothing Fluid. This protects hair during heat styling, plus tames flyaway and frizz. I don't do too much to my hair through the summer months. I usually let it air dry and don't worry about straightening or curling. I did use this as a leave in conditioner after showering and it was nice. I'm sure it'd work better as intended, but I didn't want to wait months to try it. It didn't have a strong scent and left my hair smooth. 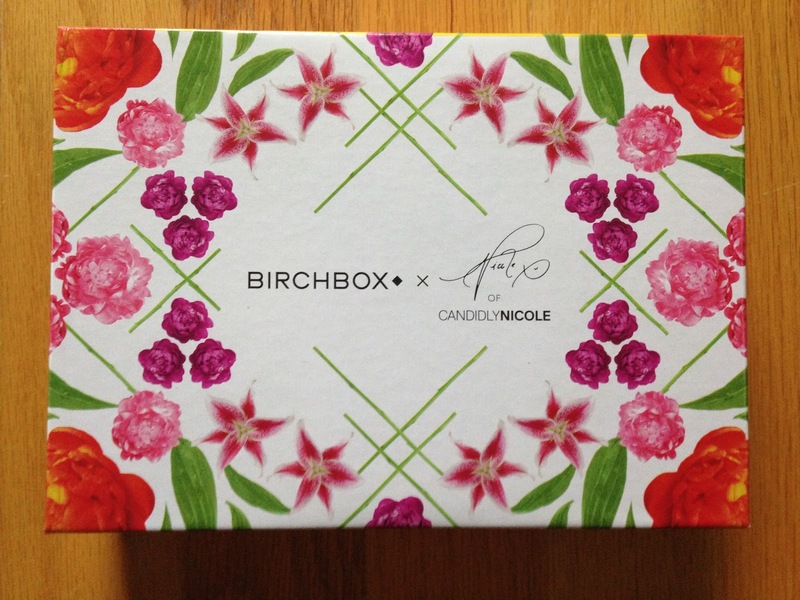 I was very happy with my Birchbox for August! And I was so excited to receive it as early in the month as I did. I can't wait to see the spoilers for next month, but it's way too early for them. I'm sure they'll be awesome. It's always difficult to choose just one.